Low back pain is a painful condition that most Americans will suffer from at some time in their lives. Unfortunately many medical and Chiropractic offices lack the training and proper treatment philosophy to address low back pain effectively. At Progressive Chiropractic we have had great success in treating low back pain. Our Progressive System of Care uses a comprehensive approach to treat not just the symptoms but the cause. 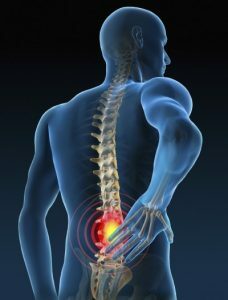 The symptoms of low back pain can vary from burning, aching, stabbing, shooting, tingling or throbbing. Most times the pain will be accompanied by muscle hypertension/spasm, muscle weakness and loss of mobility. Low back pain can start from injuries, such as a fall or car accident, incorrect heavy lifting or gradually due to a hidden degenerative spinal condition that was not addressed and treated properly with regular adjustments. At Progressive Chiropractic we find, in the majority of cases, that poor spinal alignment and function are causing increased strain on the supporting structures such as tendons, ligaments and discs. Over time poor mechanical function leads to increased degeneration of the supporting structures. This poor function leads to nerve irritation and interference known as “subluxation”. Left untreated increased degeneration can lead to herniated discs, sciatica and a variety of muscle and organ dysfunctions. Our Progressive System of Care starts with a thorough examination, most times including x-rays, in order to find the cause of the symptoms. Once a diagnosis has been made a personal treatment plan is set up to address the mechanical dysfunctions and remove the irritation to the nerves affected. Treatments typically start by addressing the pain, inflammation and muscle spasm in order to make the patient more comfortable. We do this by utilizing physical therapy modalities such as Electrical Stimulation, Ice, Moist Heat, Ultrasound and Massage. Once the patient’s pain is reduced, specific Chiropractic adjustments are delivered to restore proper motion and alignment to the affected spinal vertebrae. When appropriate, traction is used to increase disc hydration, reduce disc bulging as well increase inter-vertebral motion. As the patient’s pain is reduced specific stretches and exercises are demonstrated. These stretches and exercises are crucial to restoring long term function, strengthen supporting muscle and minimize any potential relapse. Patients are also educated about the importance of proper posture and workplace ergonomics. Our patients have demonstrated a better than 90% success rate when the recommendations of the Progressive System are regularly followed.